Pyotr Ilyich Tchaikovsky (1840 – 1893), was a Russian composer of the romantic period, some of whose works are among the most popular music in the classical repertoire. He was the first Russian composer whose music made a lasting impression internationally, bolstered by his appearances as a guest conductor in Europe and the United States. He was honored in 1884 by Emperor Alexander III, and awarded a lifetime pension. Tchaikovsky wrote many works that are popular with the classical music public, including his Romeo and Juliet, the 1812 Overture, his three ballets (The Nutcracker, Swan Lake, The Sleeping Beauty) and Marche Slav. These, along with his First Piano Concerto and his Violin Concerto, the last three of his six numbered symphonies and his operas The Queen of Spades and Eugene Onegin, are among his most familiar works. Almost as popular are the Manfred Symphony, Francesca da Rimini, the Capriccio Italien and the Serenade for Strings. The Sleeping Beauty is a ballet in a prologue and three acts, first performed in 1890. The music was composed by Tchaikovsky (his opus 66). 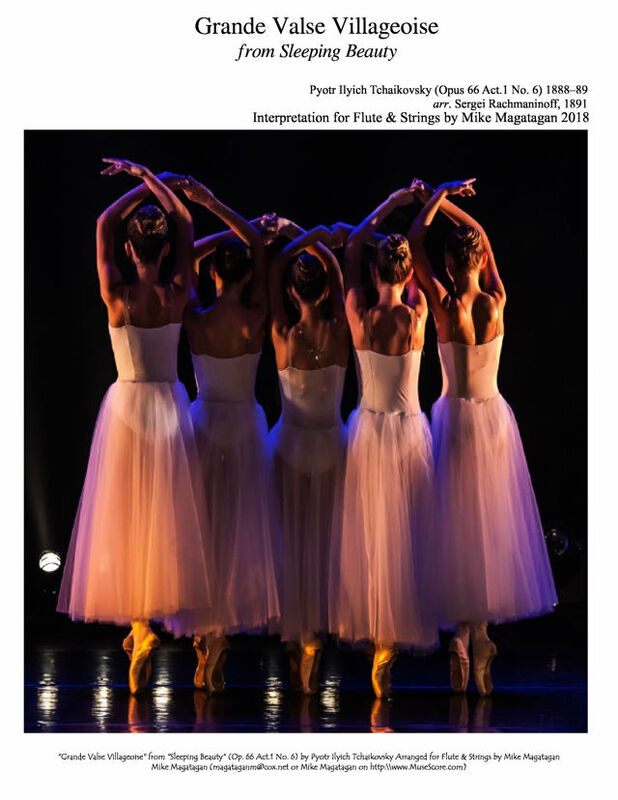 The score was completed in 1889, and is the second of his three ballets. The original scenario was conceived by Ivan Vsevolozhsky, and is based on Charles Perrault's La Belle au bois dormant. Most famously, there's the waltz from Act 1. After an exciting, anticipatory introduction, the bright, gently swaying waltz itself begins in the strings, with a second, more staccato strain punctuated by brass chords. The principal melody reappears against chirping figures in the woodwinds, only to give way to a charming episode for flute and glockenspiel. 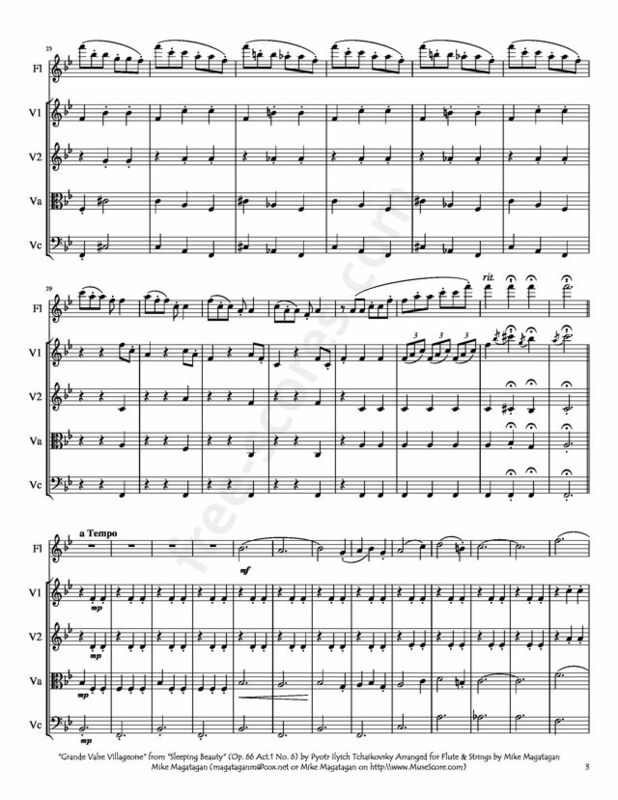 The entire waltz, minus the introduction, is then repeated, and ends with a festive coda. In 1890, Alexander Siloti was approached to arrange the music for piano duet. He declined, but suggested his then 17-year-old cousin Sergei Rachmaninoff would be more than competent. This offer was accepted, although Siloti supervised the arrangement. Rachmaninoff himself arranged the entire score for piano solo. 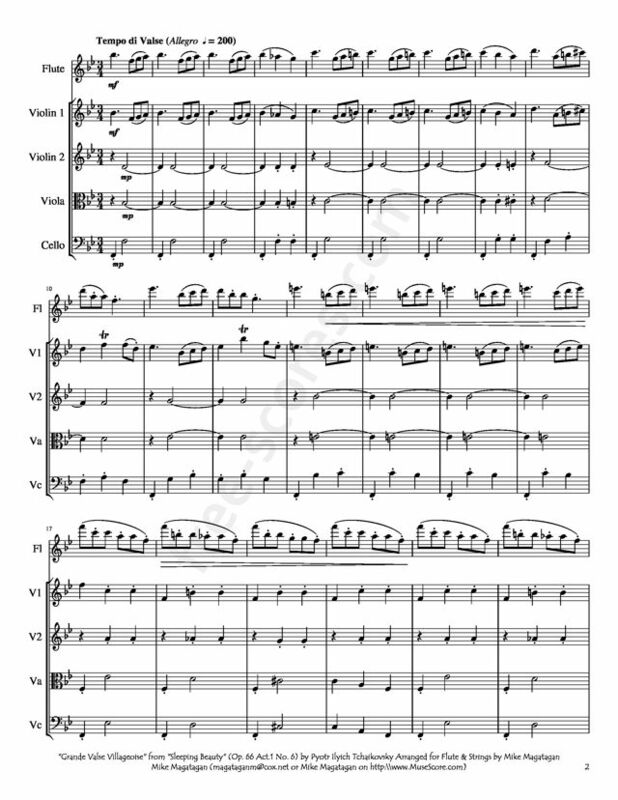 It is from this score that I created the following interpretation of the Grande valse villageoise (a.k.a. The Garland Waltz) from Act I No. 6. Although originally composed for Orchestra (and later re-arranged for Piano Duet by Sergei Rachmaninoff), I created this interpretation of the Grande Valse Villageoise (Op. 66 Act.1 No. 6) for Flute & Strings (2 Violins, Viola & Cello).